XBRL is an open-source computer language that allows companies to precisely tag the thousands of pieces of financial data included in typical financial statements and footnotes. These XBRL tags make the financial data computer-readable and allow users of financial statements to electronically search for, assemble, and process data - so analysts, investors, journalists, and regulators can readily access and analyze it. Currently in use at stock exchanges, the U.S. Securities and Exchange Commission (SEC) and regulators like the Federal Deposit Insurance Corporation (FDIC) and several others across Europe and Asia Pac, XBRL has clearly established the standard for disclosure in the 21st century. 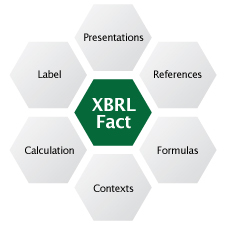 XBRL is like a barcode that links facts to a wealth of metadata. XBRL is an extensible, open standard on top of XML. XBRL extends XML to improve the efficiency, accuracy and transparency of reporting and information exchange. The key to the power of XBRL is the concept of a taxonomy, or metadata model. The taxonomy not only tags the data but also defines structure to the information being exchanged, business rules that operate on the information, and a framework for easily creating new taxonomies by extending existing ones. Taxonomies exist today for a wide range of business applications from US GAAP and International Financial Reporting Standard (IFRS) through to COREP/FINREP (under Basel II Accord), Solvency II, CRAS (Credit Risk Assessment Services) and Risk Return Summaries for Mutual funds. XBRL improves the quality and speed of information exchange while reducing overhead. XBRL is establishing the standard for disclosure in the 21st century. The implementation and deployment of XBRL will drastically reduce the costs of information collection and dissemination, while substantially improving the accuracy and quality of the data. XBRL improves the quality & performance of information exchange. The computational validation capabilities provided by XBRL improves the quality and time performance of a company's information exchange processes. Deployment of XBRL within an organization increases the business value of data, provides data transparency, and empowers employees at all levels with immediate access to high quality internal and external data. XBRL helps ensure regulatory compliance. Regulators adopting XBRL as the required standard for filing see many benefits, starting with more accurate filings because of the power to embed business rules and calculations within XBRL. This leads to a reduced administrative burden, providing better oversight at reduced costs. These regulators then drive companies to adopt XBRL as they need to report in the XBRL format to meet their compliance requirements. Once organizations make the effort to report externally in XBRL, they also realize the benefits of efficient reporting. XBRL also provides ready-made taxonomies for various compliance needs such as IFRS, US GAAP, and many others. Being XML-based, XBRL is complex and not easily read or written by business users. The SEC has mandated XBRL compliance, but without providing issuers with simple, inexpensive tools to output their financials into XBRL - resulting in delayed adoption and a myriad of compliance issues. It is difficult to load XBRL filings into a relational database for reporting and analysis using common Business Intelligence (BI) tools. Global adoption of XBRL as the financial reporting standard has rushed organizations into adoption before an integrated XBRL productivity toolset was readily available. 2009 - Developed the first zero-footprint XBRL data collection facility in the world, delivering maximum compliance. 2010 - Developed the first ready-made XBRL analytics platform that dynamically handles multiple concurrent returns and taxonomies. 2011 - Developed the first XBRL taxonomy and returns management application, truly designed with the business user in mind. Combined, these components provide the first and only fully-integrated, zero-footprint end-to-end XBRL regulatory solution for data collection, reporting, monitoring and analysis. The COREP/FINREP Taxonomy provides an XBRL representation of the Committee of European Banking Supervisors (CEBS) Common Reporting Framework. FINREP (FINancial REPorting) is designed for credit institutions that use IAS/IFRS for their published financial statements. Recently, the Securities and Exchange Commission (SEC) officially announced the adoption of XBRL for U.S. listed issuers' financial statement filings. By providing the IFRS Taxonomy, the IFRS Foundation seeks to address the demand for an electronic standard to transmit IFRS financial information. Trillions of dollars, in fact over two thirds of global market capitalization is essentially being reported in XBRL format. Hundreds of XBRL initiatives in a dozen countries or more are currently being deployed - it's safe to say that XBRL is establishing the standard for disclosure in the 21st century. Application of XBRL towards capturing and reporting against corporate contribution to social justice, environmental protection and human rights is also now emerging, and is without a doubt merely the tip of a much more significant iceberg.